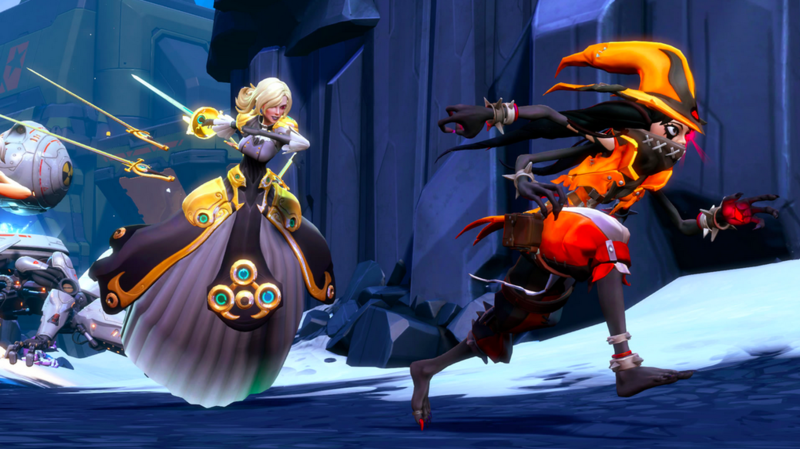 Let’s get one thing straight; reviewing a game like Battleborn isn’t easy. Assessing the strengths and weaknesses of a single player campaign is a far more comfortable affair, as the factors defining that experience will generally remain consistent as is. However, with a predominantly multiplayer game, the measurements of value get murky. After all, what is a multiplayer game without a strong community? While I enjoyed Star Wars: Battlefront well enough during the launch period, ongoing network latency issues and a rapidly disappearing local audience on PC did not become evident until later on. So it is that I have a similar conundrum with Battleborn; while the purpose of this review is to share my thoughts on the game in its current state, its longevity and value will rely entirely on post-launch support from Gearbox and commitment from the community. I might be stating the obvious, but it’s important to get this out of the way for very multiplayer-centric games. And that’s what Battleborn is at heart. In a similar stroke of popular design as evident in Blizzard’s Overwatch and Epic’s upcoming Paragon, Battleborn is a little bit MOBA and a little bit Team Fortress 2, which means it’s a game all about choosing your favourite looking and playing unique hero and beating the hell out of the enemy. With a first person perspective, and equipped with an assortment of unique abilities and skills, I’d like to throw a bit of Super Smash Bros influence into the fray too because hey, why not. As with many games of its ilk, this is Battleborn’s strength; the sheer variety of characters and joy in exploring their abilities. While some obvious by-the-books shooter staples are there, like your low health ranged sniper, the sword swirling high moblility ninja, and super strong tank guy, Gearbox has done a fairly impressive job at keeping each character defined and unique. The art style is heavily adoptive of a Saturday Morning Cartoon aesthetic, with rich colours, comical proportions, and animated special effects stylised to resemble something out of a cartoon. The premise of our heroes and villains fighting for survival over one of the last known active stars in the universe has granted Gearbox a decent amount of wiggle room in creating all kinds of kookie characters, even if I feel they could have gone further than mostly anthropomorphic warriors (even if some of those are space elves). To keep battles interesting, each character utilises a helix upgrade tree that’s tethered to their unique abilities. The idea is that during play you’ll acquire experience points through conquering opponents and objectives, and levelling up allows you to shape the specific strengths of the role you’ve chosen to play. In practice it works great, and is a snappy carrot-on-a-stick to keep the moment-to-moment match flow interesting, knowing that it’ll likely only take a few minutes until your character can supplement abilities with additional bonuses. For example, Thorn is a space elf who specialises in bow use with the ability to cast an area blight spell on selected ground. While having a bow means she’s best played with a bit of patience and care, her upgrade path essentially allows you to shift her role between one focus or the other (without making the alternative redundant), and then developing that ability further again. I might chose to emphasis blight, casting as many area spells as I can. But I can also chose how blight impacts the flow of play. So, do I upgrade blight to weaken trapped opponents to curse arrows? Or do I supplement blight with the ability to heal my own team members who happen to find themselves on the same terrain? 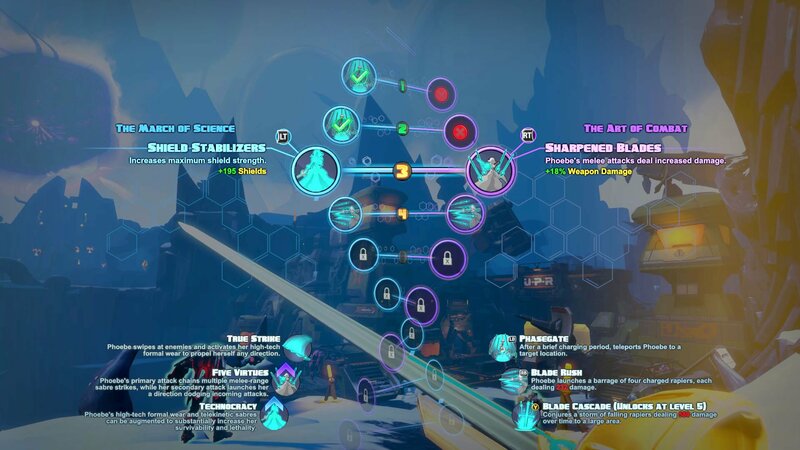 As Battleborn is inherently a team based game, this per-match upgrade depth coupled with the cast of characters and each unique ability is really what makes it shine. Early in a round you might find everyone playing a little conservatively as they cherish their livelihood and consider how the opposition and their teammates will play, and then a couple of levels later everybody is well on their way to shaping a unique flavour of their chosen character and role within the match. Unfortunately a lot of this tends to fall apart when you consider the whole package, especially when you ponder what lead Gearbox down this path. To be perfectly honest, Battleborn does at times feel like a mangled Borderlands. Let it be said they are ultimately very different games, but I do feel the influence is there, particularly in the defined character identities and classes, with their special abilities, and upgrade trees to supplement those abilities. It does seem that Gearbox looked at that strength from Borderlands and figured they’d make an entire game around it. While this idea is fine in theory (see: Overwatch), I’m not convinced it has the strengths of Borderlands, particularly in a long term focus and strength of character identities. Chunks of the cast are unfortunately a bit dull and unmemorable, and the writing fails to elevate the concept beyond a handwaved excuse for a bunch of character designs to kill each other. A co-op single player mission mode again, but this is where echoes of Borderlands are most obvious. Co-op Borderlands was tremendous fun, but Battleborn is lukewarm by comparison. It’s stripped of its predecessor’s more nuanced progression, in favour of over-reliance on a combat system that just isn’t a lot of fun when thrown up against hoards of bullet sponge enemies in environments that have no memorable staying power. 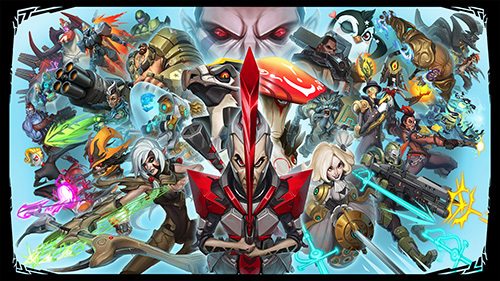 Battleborn is indeed at its best in the standard multiplayer, featuring game modes like capture-and-defend that you’ve come to expect, where an emphasis on battling the other classes directly and those classes strategically intermingling highlight how much fun the game can be. 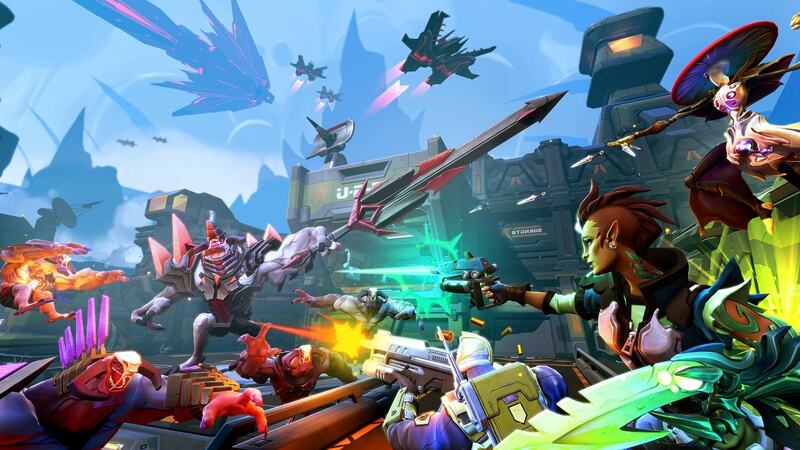 Battleborn is better when it’s doing its own thing and getting right to the point, not treading though a flat co-op story arc where the core combat simply isn’t satisfying enough justify grinding through hordes of goons. In that respect Battleborn sometimes feels a bit unfocused and unfinished. Undercooked, maybe, to use tired terminology. I think Gearbox would have benefited from really focusing on their cast and progression system instead of superfluous co-op story content. Sure, the current systems are great, but that’s the point; an even more dynamic and robust set of variations and factors in an already snappy multiplayer system would be further enhanced the existing vision. Sometimes it seems like Battleborn doesn’t really know what to focus on, and it comes at a cost when compared to upcoming games that clearly do (again with that dead horse; Overwatch). Thankfully that multiplayer flair and cast of characters warrants admission for anybody who does enjoy these kinds of games. This is especially true if you’ve a flavour for the Gearbox manner of characterisation and buffoonery, which might even elevate Battleborn‘s presentation over Blizzard’s offering. As noted in my opening paragraphs, long term community stability and developer support will dictate much of Battleborn‘s value as we move into the upcoming months. But for now it’s a pretty safe and enjoyable romp for anybody looking for a snazzy new pick-up-and-play multiplayer game.